Explore options to visualize, drill-down and slice your geographicaly related data. 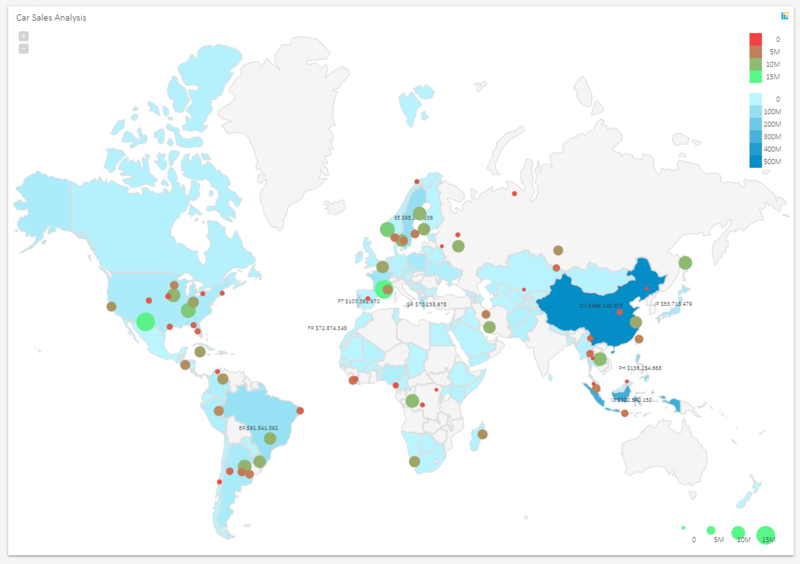 Kyubit dashboards is great place to analyze data related to countries, regions, cities or additionally custom created locations in Kyubit application. Presents values from analysis or query results as a single color gradients on the selected geo map. Simple way to visualize influence of the selected values geographically. Data from analysis or query. Values rendered as gradient geo map. 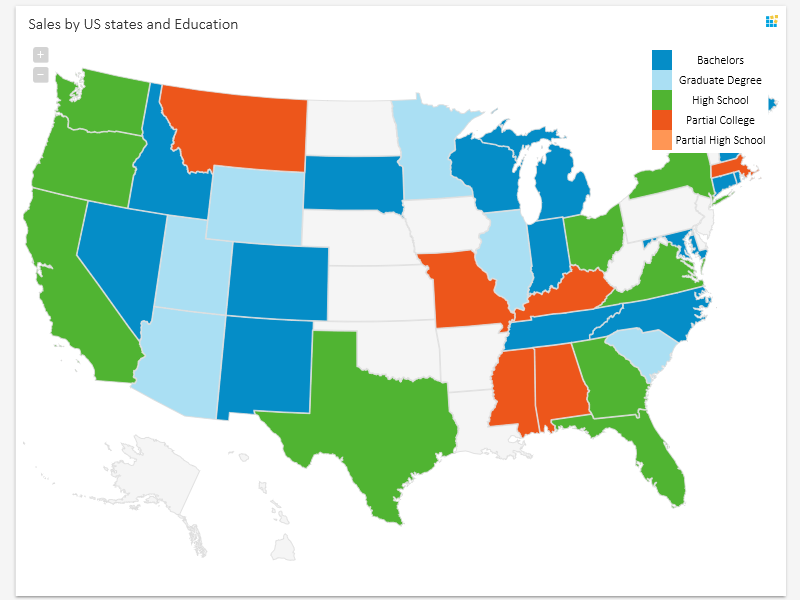 Values rendered as dominant series colors geo map. To display values related to cities or any other geographic locations related to your data, use data set 'Markers' defined in Tile -> Edit -> Options -> Markers section. Kyubit with setup automatically deploys 7300 largest cities in the world. If your data includes places and geo location not included in initial set of 7300 biggest cities, you can easily add locations in 'Geo Location Management' application section (explained below). 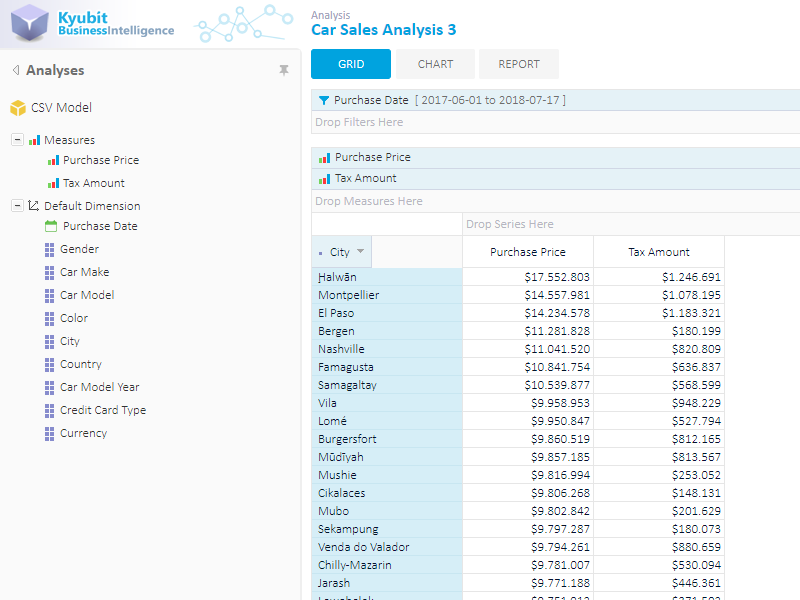 Data from analysis or query with two measures. Each measure 'Purchase Price' and 'Tax Amount' will be rendered using Geo markers to visually identify impact of both values. Setting values to be rendered as geo markers. While 'Purchase Price' amount impact is rendered with colors (from red to green), impact of 'Tax Amount' is rendered with circle radius from 3 to 15. Looking at the geo map, user can quickly identify impact of both measures for each city (geo location) on the map. 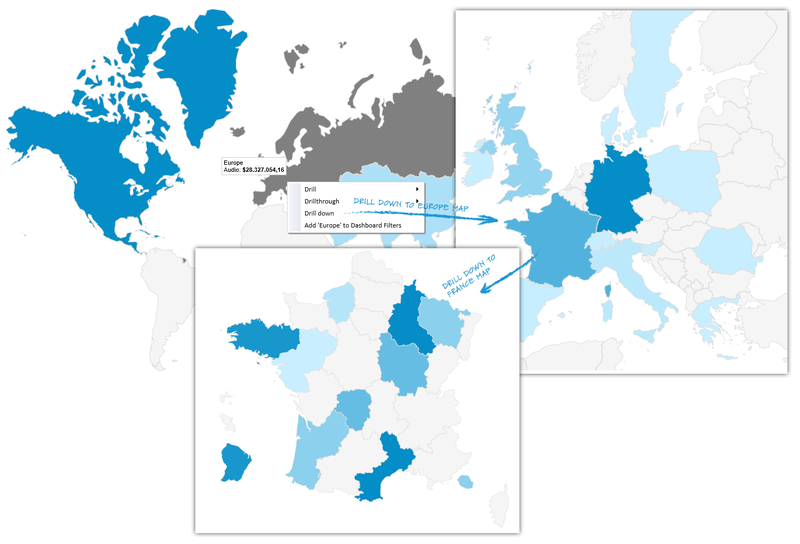 Geo locations (markers) data could be combined with country/regions data, rendered as blue gradients in this example. To manage all geo locations in Kyubit application, go to Administration -> Geo Locations section. Kyubit Administrator has rights to add, change or delete geo locations in the system. After Kyubit BI setup, automatically 7300 largest cities are loaded to Geo locations, while administrator can manage all entries at any time. 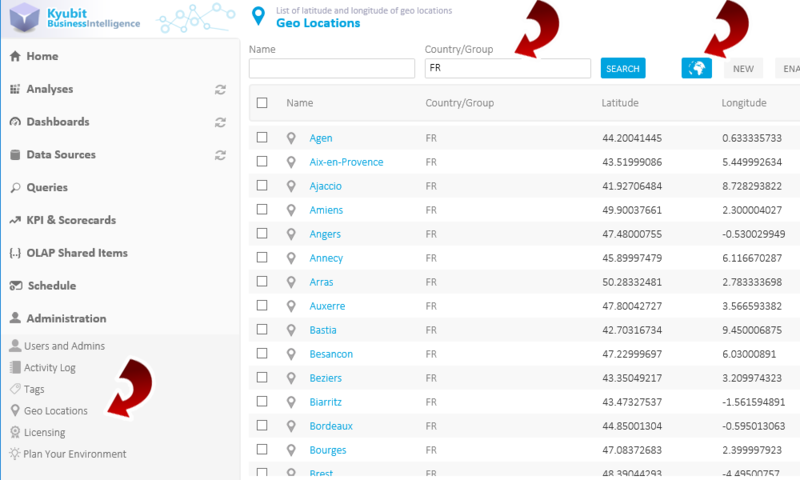 In the Geo Location section administrator can search all geo locations by location name or country/group field, quickly visualize all geo location from same country/group, delete existing or add new geo location entries that will be immediately ready for usage in geo location visualizations and analysis. 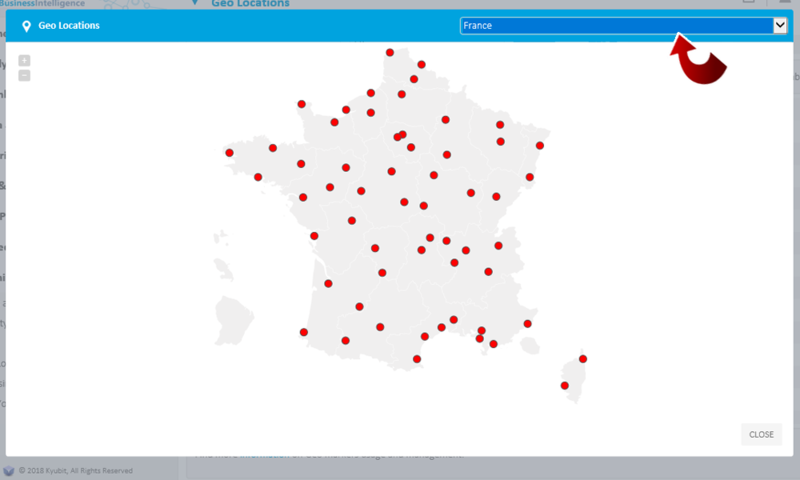 Listing all geo locations in the system related to France, for example. List of all geo locations is displayed as list with names and geographical positions. Click on the 'Globe' icon to visualize listed geo locations on the geo map. At any time, change geo map country/region for more appropriate view of geo locations. To add new geo location, click the map on the position of new geo location and new geo location dialog will be displayed to add name and save geo location. 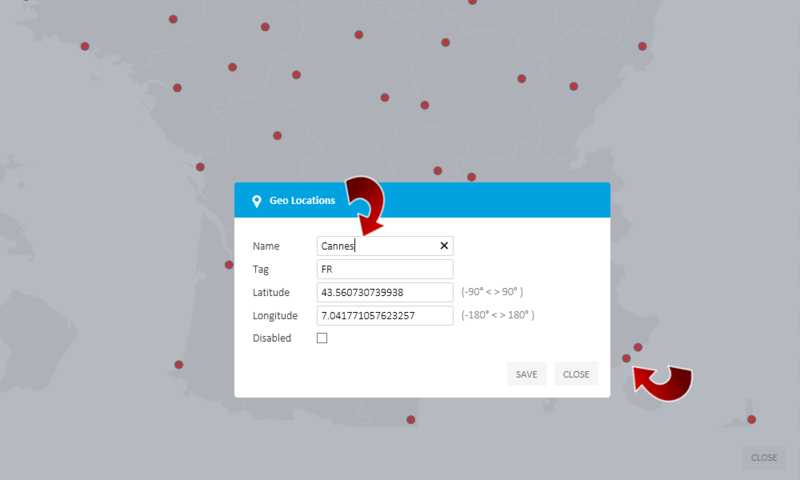 If there are many geo locations with known name and geographical position you wish to add more quickly, it is possible to directly add new rows in Kyubit internal database 'KyubitAnalysisDB', table 'GeoLocations', which is straightforward to comprehend and maintain. 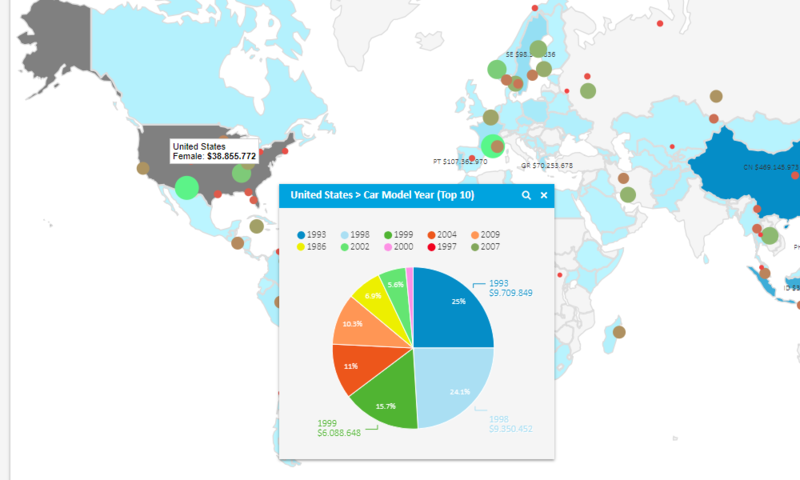 Set dimension of interest to become 'Quick Explore' dimension for particular geo map on the dashboard. 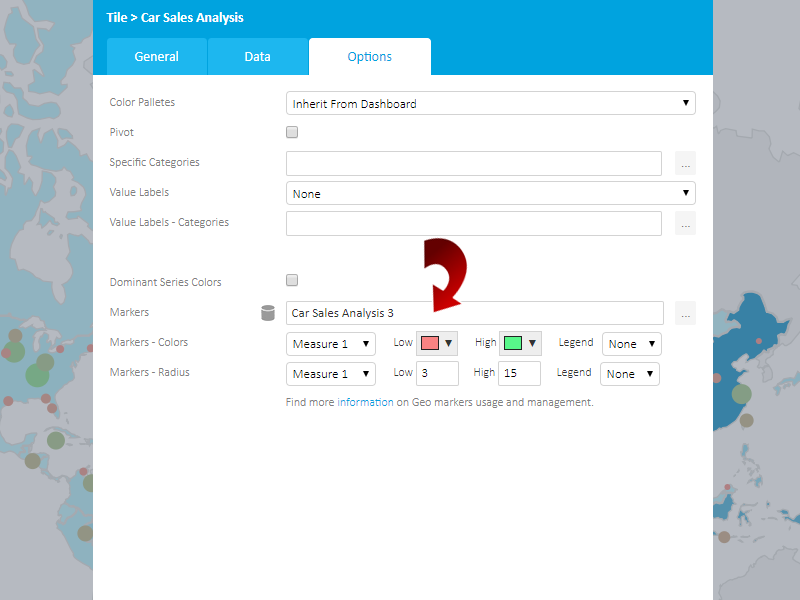 While configuring Dashboard tile choose one of the available dimensions from analytic data source (OLAP cube or Analytic Model). 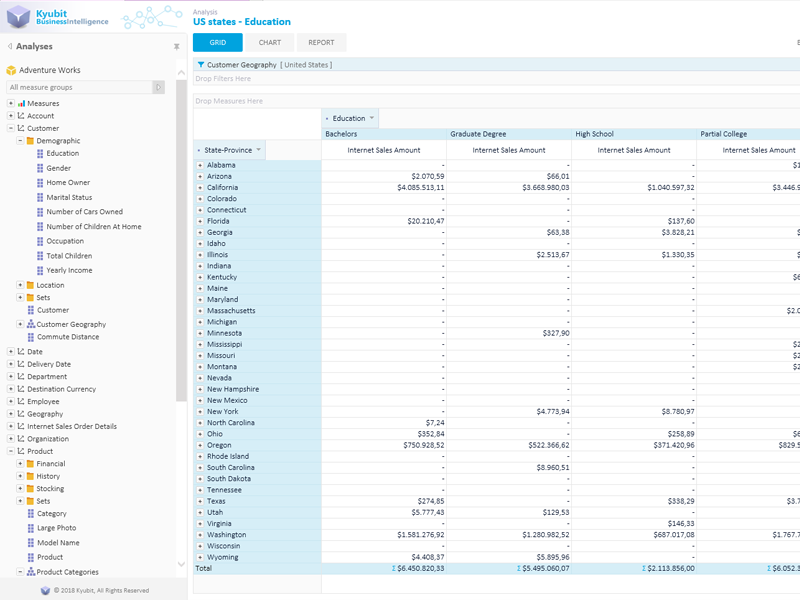 Select 'Quick Explore' dimension and appropriate chart type for 'Quick Explore' visualization. Outside design mode, 'Quick Explore' could be set with right click on the chart header. 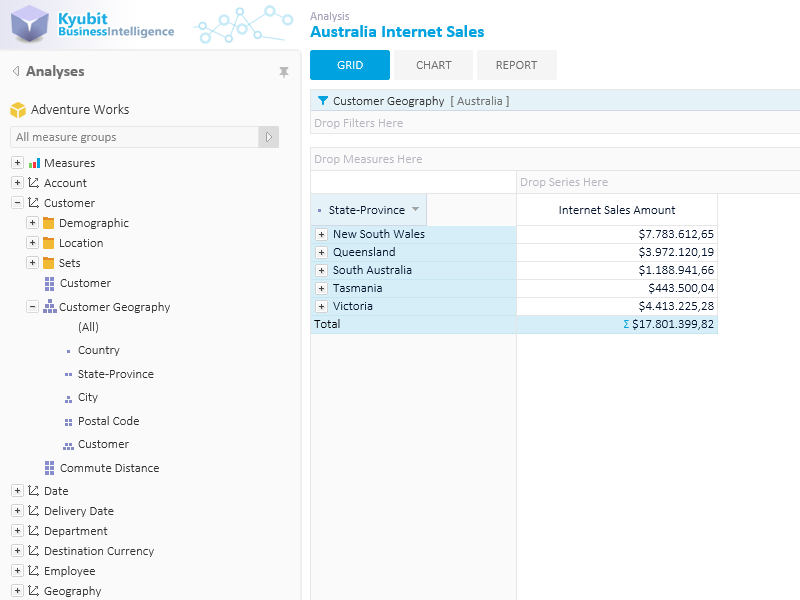 End-user only has to click on any geo chart segment to get immediately small window with 'Quick Explore' results with defined dimension member values displayed in selected chart. If Geo map use OLAP data, Geo map tile has option to drill down geo map areas to its child geo map representation. Continents are drill down to countries, countries are drill down to regions. 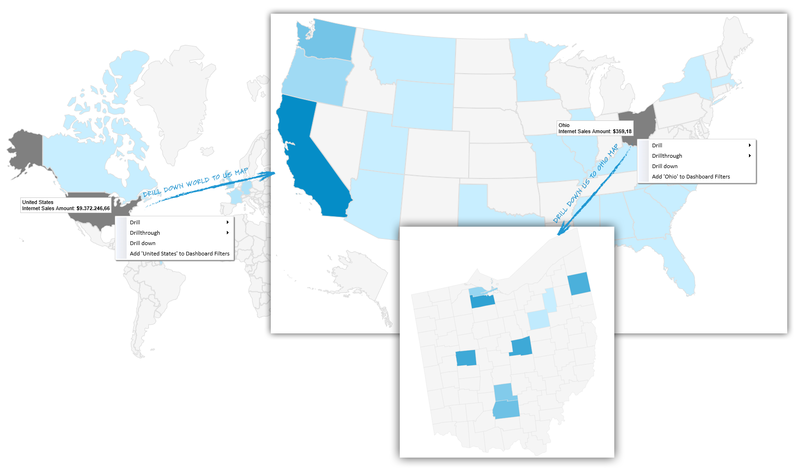 Analyzing geo data on dashboard becomes perceptual and comprehensive. Within few clicks users isolates and observes data in geographical form, that could be easily exported to PDF file or share with other users. 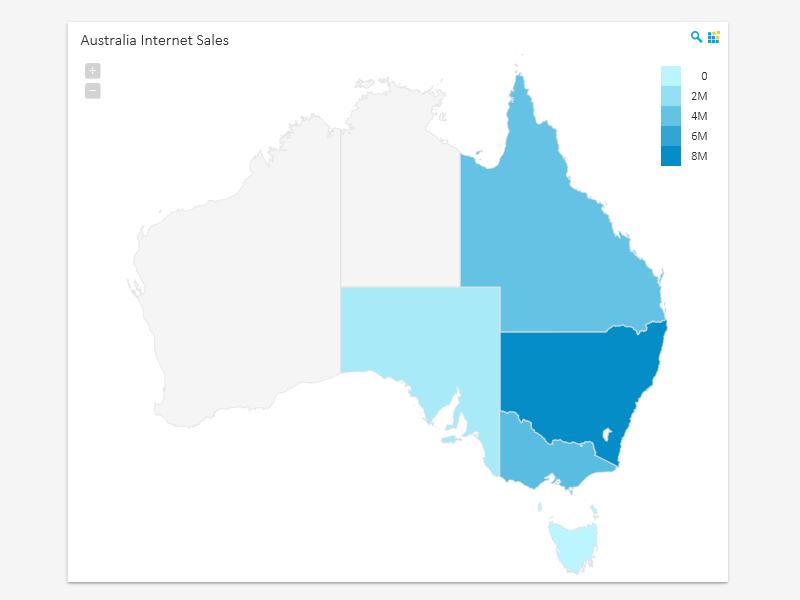 With every new version of Kyubit Business Intelligence application, more countries and regions are available to use by Geo Maps feature on the dashboards. All Continents and largest countries with their regions are available, but also Kyubit will provide Geo maps for other countries and regions of your interest. Please, contact us for more details when country or region of your interest will be available. Currently available maps: Contintents, World, Europe, North America, South America, Asia, Africa, Oceania, USA, Russia, India, France, Germany, UK, Netherlands, Norway, Spain, Switzerland, Italy, Australia, Thailand, Austria, Australia, Turkey, Saudi Arabia, Denmark, Egypt, Portugal, Brazil, Hong Kong, Indonesia and Ohio State (US). More countries and regions are expected soon. 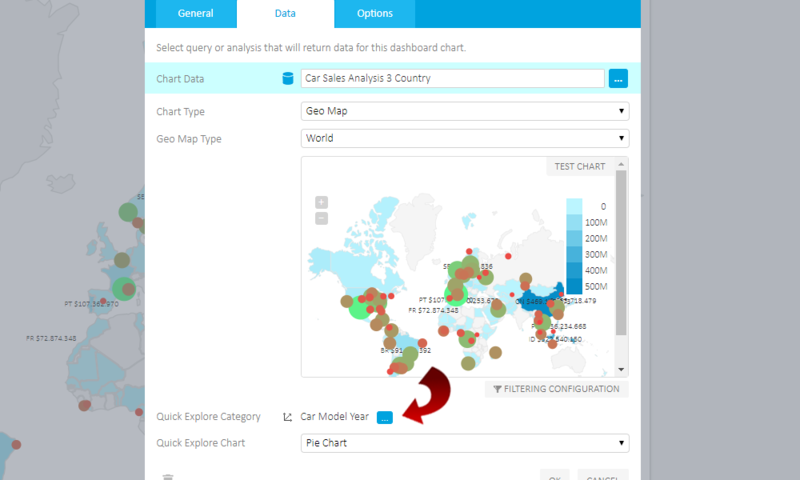 Check latest section of Dashboards user manual to see all countries/regions and codes and names that could be used to render SQL and OLAP data.